Modern water legislation strives to build the institutional foundation for sustainable water resource management and protection of important habitats and species. 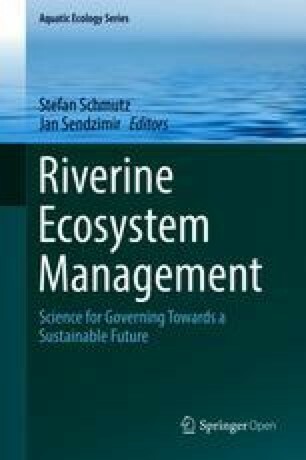 This chapter provides an overview of the most important legislative framework for river ecosystem management on the international and European levels, profoundly influencing and guiding national water legislation. At international levels, the most prominent legal acts for improving freshwater governance and fostering the equitable and sustainable sharing of transboundary watercourses are the UNECE (United Nations Economic Commission for Europe) Convention on the Protection and Use of Transboundary Watercourses and International Lakes as well as the UN (United Nations) Convention on the Law of the Non-Navigational Uses of International Watercourses. Due to its importance for the conservation and use of wetlands, especially as waterfowl habitat, the Convention on Wetlands of International Importance is also described. The most relevant legislation for river ecosystem management in the European Union is the Water Framework Directive (WFD). It establishes a European Union-wide basis for integrated water resources management based on a river basin management approach. This chapter explains how the Directive—legally binding for all EU Member States—serves as an umbrella for measures related to drinking and bathing water, urban wastewater treatment, groundwater protection, floods, and protection of waters against the impacts of agricultural pressures such as from nitrates in organic and chemical fertilizers and/or industrial emissions. Additionally, the WFD ensures a strong linkage with the provisions of the Birds and Habitats Directives. The latter aims to protect Europe’s most valuable species and aquatic ecosystems by finding a good balance between water and nature protection and the sustainable use of water resources. Since the adoption of the international water conventions as well as the WFD, many positive achievements have occurred. However, several challenges and shortcomings remain in implementing the relevant legal provisions for the sustainable management of rivers and aquatic ecosystems. Selected issues are highlighted in this chapter by describing how legislation can address and adapt to water management issues in the twenty-first century. International law is defined as the set of principles and rules generally regarded and accepted as binding for those entities subject to it, usually states, but also the United Nations and the European Union, in their conduct with each other (Article 38 Statute of the International Court of Justice). The development of international law is one of the primary goals of the United Nations (United Nations 2016a). International water conventions and multilateral and bilateral agreements are the major sources of international water law, a subset of international environmental law. The legal form of conventions and agreements is of binding nature on the contracting parties establishing respective rights and obligations governing their relations. As a general rule, a treaty applies only to those states that have expressed their consent to be bound by it. This is an issue of state sovereignty. Depending on the number of parties involved, treaties may be bilateral (two state parties) or multilateral (more than two state parties), either with limited (open for signature by a restricted number of countries) or with universal (open for participation by all states) participation. To become party to an international convention, a state must express, through a concrete act, its willingness to undertake the legal rights and obligations contained in the treaty. This is usually accomplished through signature and ratification of the treaty, or if it is already in force, by accession to it (United Nations 2016a). More than 3600 international agreements, both bilateral and multilateral, exist which address water-related issues in transboundary rivers, lakes, and seas, focusing on a particular region, a river basin or a part of one (Vinogradov et al. 2003; United Nations 2016b). Although the vast majority of these agreements signed from AD 805 to 1984 relate to navigational issues, boundary delineation, or fisheries-related matters, a growing number focus on water management issues addressing water as a limited and consumable resource (United Nations Food and Agriculture Organization 1978, 1984; United Nations Environment Programme 2002). The most important international general framework water conventions are the UNECE Convention on the Protection and Use of Transboundary Watercourses and International Lakes (United Nations 1992) and the UN Convention on the Law of the Non-Navigational Uses of International Watercourses (United Nations 1997). Both conventions include, on the one side, substantive elements determining rules for the use of waters and, on the other side, procedural provisions defining certain requirements for the management of transboundary watercourses. The UNECE Convention on the Protection and Use of Transboundary Watercourses and International Lakes, adopted in Helsinki in 1992 and entered into force in 1996, aims at protecting and ensuring the quantity, quality, and sustainable use of transboundary water resources by facilitating cooperation among the riparian countries. It strengthens measures for the ecologically sound management and protection of transboundary surface waters and groundwater. The three central obligations of the Convention are the prevention, control, and reduction of transboundary impacts, the reasonable and equitable use of waters, and the cooperation of riparian countries through agreements and joint bodies (United Nations Economic Commission for Europe 2011). The Convention counts 41 contracting parties as of May 2016 (United Nations 2016c). Almost all countries sharing transboundary waters in the region of the UNECE are Parties to the Convention (Fig. 17.1). An amendment of the UNECE Water Convention from the year 2003, which entered into force in 2013, allows all UN member states to become party to it (Trombitcaia and Koeppel 2015; United Nations Economic Commission for Europe 2016b). By the end of 2014, more than 50 states from outside the UNECE region have participated in meetings and activities of the UNECE Water Convention (Trombitcaia and Koeppel 2015). The UN Convention on the Law of the Non-Navigational Uses of International Watercourses, adopted in New York in 1997 and entered into force in 2014, forms a global legal framework establishing basic standards and rules for cooperation on the use, management, and protection of international watercourses. The Convention counts 36 contracting parties as of May 2016 (United Nations 2016d). Both Conventions play a role in improving freshwater governance and support interstate cooperation by fostering the equitable and sustainable sharing of transboundary watercourses across the world. The two instruments vary in their scope, substantive and procedural rules, as well as institutional and dispute settlement mechanisms (Wouters and Vinogradov 2003; Rahaman 2009; McCaffrey 2015; Tanzi 2015; United Nations 2016e). While the UN Water Convention is primarily providing some basic principles and is addressed to the global community of watercourse states, the UNECE Water Convention is stricter and includes more detailed provisions with respect to the prevention of transboundary impacts and the mandatory character of institutional cooperation between riparian states (Wouters and Vinogradov 2003; Tanzi 2015). As the differences between the two conventions are not of a conflicting legal character, but an issue of stringency and detail, the UNECE Water Convention is not invalidated through derogation by the later UN Water Convention under the principle of lex posterior derogat priori (Tanzi 2013, 2015). It is questionable as to whether the UN Water Convention will ever find its prominent place in international water law. While the UN Water Convention is in force since the year 2014, the UNECE Water Convention is legally binding, institutionally developed, and supported with funding as leading instrument of international water law since 1996 (Rieu-Clarke and López 2013; Stoa 2014). The UNECE secretariat servicing the UNECE Water Convention is located in Geneva (Switzerland), and working groups on Integrated Water Resources Management and on Monitoring and Assessment are established (United Nations Economic Commission for Europe 2016a). The importance for its global relevance was confirmed in the year 2013 by the opening of the UNECE Water Convention for any UN member state to accede to it. The UNECE Water Convention has already significantly influenced the management of transboundary waters by forming the basis for many bilateral and multilateral basin-specific agreements such as for the Danube, the Meuse and Scheldt, the Oder, and the Rhine river basin as well as many transboundary waters in the UNECE region (United Nations Economic Commission for Europe 2012; Moynihan 2015). Most of these agreements either refer specifically to the UNECE Water Convention as their “parental” instrument or adopt terminology and various provisions of the Convention’s general rules as well as legal principles guiding actions of national public authorities and individuals (Wouters and Vinogradov 2003; Keessen et al. 2008; Tanzi et al. 2015). The primary substantive rules are the governing rules of “equitable and reasonable utilization” of water resources and the “obligation to take all measures necessary not to cause significant harm” to other basin states or to their environment. This principle entitles each basin state to a reasonable and equitable share of water resources for the beneficial uses within its own territory. It rests on the principle of shared sovereignty and equality of rights. “Equitable” utilization does not necessarily mean an equal portion of the resource or equal share of uses and benefits. The UNECE Water Convention includes this principle in Article 2.2c; the UN Water Convention stipulates the equitable and reasonable utilization of an international watercourse in Articles 5 and 6. Compared to the UNECE Water Convention, the UN Water Convention provides more guidance on the factors for assessing the equitable and reasonable utilization of an international watercourse (Tanzi 2015). No state in an international drainage basin is allowed to use the watercourses in their territory in a way that would cause significant harm to other basin states or to their environment, including harm to human health or safety, to the use of the waters for beneficial purposes, or to the living organisms of the watercourse systems. This principle is specified in Articles 2 and 3 of the UNECE Water Convention, and included in many Articles of the UN Water Convention, but is particularly addressed in Article 7. More precise and coordinated guidelines and advanced standards of conduct on the prevention of transboundary impact are included in the UNECE Water Convention (Tanzi 2015). To properly realize the substantive rule of equitable and reasonable utilization and the obligation not to cause significant harm, certain procedural rules are necessary, including the prior notification of planned measures, consultation and negotiation, and the principles of cooperation and exchange of information. Every riparian state along an international watercourse is entitled to prior notice, consultation, and negotiation in cases where the proposed use by another riparian of a shared watercourse may cause serious harm to its rights or interest. The UNECE Water Convention regulates the obligation for consultation among riparian countries in Article 10; the UN Water Convention includes provisions as regards notification concerning planned measures, consultation, and negotiation predominantly in Articles 11 to 19. It is a responsibility for each riparian state along an international watercourse to cooperate and exchange data and information regarding the state of the watercourse as well as present and future planned uses along the watercourse. The need for information exchange is specifically addressed in Articles 6 and 13 and the principle of cooperation in Article 9 of the UNECE Water Convention; the general obligation to cooperate and the regular exchange of data and information are specifically enshrined in Articles 8 and 9 of the UN Water Convention. Institutional mechanisms, including provisions for the institutional management of transboundary waters and dispute settlement procedures, complete the general provisions of international water legislation. Transboundary water controversies and disputes are often resolved under the auspices of various international organizations and bodies, such as river basin commissions established by multilateral or bilateral river basin agreements (Wouters and Vinogradov 2003; Tanzi and Contartese 2015). Under the UN Water Convention, states are encouraged to create institutional management mechanisms, but are not obliged to do so (Article 24). On the contrary, Article 9 of the UNECE Water Convention stipulates that institutional cooperation between riparian states is mandatory. The riparian parties shall enter into bilateral or multilateral agreements in order to define their mutual relations and conduct regarding the prevention, control, and reduction of transboundary impacts. All states in an international watercourse should seek a settlement of any disputes by peaceful means, in case states concerned cannot reach agreement by negotiation. The UNECE Water Convention regulates the settlement of disputes in Article 22 and Annex IV. Article 33 of the UN Water Convention specifies the procedures in the event of a dispute between two or more riparian parties of the Convention. The conservation and use of wetlands is regulated in the Convention on Wetlands of International Importance, especially as waterfowl habitat (United Nations 1971). The Convention was adopted in Ramsar in 1971 and entered into force in 1975; as of May 2016, the Convention counts 169 contracting parties (Ramsar Convention Secretariat 2016). The Secretariat coordinating the Convention’s activities is based at the headquarters of the International Union for Conservation of Nature in Gland (Switzerland). The Convention’s mission is the conservation and wise use of wetlands through local and national actions and international cooperation. The contracting parties commit to work toward the wise use of all their wetlands, designate wetlands of international importance, and ensure their effective management as well as cooperate internationally on transboundary wetlands (Ramsar Convention Secretariat 2016). Wetlands are defined as any land area that is saturated or flooded with water, either seasonally or permanently (Article 1 of the Convention; Ramsar Convention Secretariat 2016). Inland wetlands include aquifers, lakes, rivers, streams, marshes, peatlands, ponds, floodplains, and swamps. Coastal wetlands include all coastlines, mangroves, saltmarshes, estuaries, lagoons, sea grass meadows, and coral reefs. As of 2015, there are over 2100 designated Ramsar sites covering more than 208 million hectares worldwide (Ramsar Convention Secretariat 2016). Through its recognition of the fundamental ecological functions of wetlands as regulators of water regimes, the Convention plays a crucial role in integrated water resources management (De Chazournes et al. 2015). The protection of wetland ecosystems and their benefits is therefore essential to ensuring the sustainable utilization of water resources (Ramsar Convention Secretariat 2010). The three sources of European Union law are primary law (treaties establishing the European Union), secondary law (such as regulations and directives based on the treaties), and supplementary law, including case law by the European Court of Justice, international treaties, and general principles of European Union law. The entirety of European law is called acquis communautaire which has been agreed upon in the community of the European Union (European Commission 2016a). The collection of all European environmental law is called environmental acquis communautaire. European water law is a subset of the environmental acquis communautaire. While the European Commission has the monopoly on proposing legislation, the European Parliament and the Council of the European Union representing all EU-28 Member States have the role of adopting European law. All EU Member States must obey the acquis, and all candidate countries must accept the acquis to become a member of the European Union; it is translated into the official languages of the European Union. The European Commission is the “guardian of the treaties” having the power to oversee a proper compliance and implementation review system in case EU Member States do not properly apply European law (European Commission 2016b). The Directive is the most commonly used legal act for environmental law and the major source of European water legislation. It regulates legally binding objectives, but leaves it to the discretion of EU Member States as to how to implement the objectives in national legislation. When an EU Member State fails to implement a Directive, the European Commission may take legal action by launching an infringement procedure and referring the case to the European Court of Justice for a ruling. European legislation in water management has substantially changed since the early 1970s. From the protection of specific uses of waters (fish and shellfish waters) and sectors (drinking and bathing water) to addressing water pollution at the source (urban wastewater, nitrates from agriculture), it has developed into a system of integrated water resources management in Europe. The most important Directive with regard to river ecosystem management is the WFD, fostering a holistic approach for the protection of all waters and serving as an umbrella for measures related to drinking and bathing water, urban wastewater treatment, groundwater protection, floods, and protection of waters against agricultural pressures or industrial emissions (European Commission 2016c). The WFD (European Parliament and Council 2000), adopted in the year 2000, establishes a governance framework for all waters in the European Union, which prevents further deterioration and protects and enhances the status of aquatic ecosystems, promotes sustainable water use, aims at enhanced protection and improvement of the aquatic environment, ensures the progressive reduction of pollution of groundwater and prevents its further pollution, and contributes to mitigating the effects of floods and droughts by applying a river basin approach. The Directive is substantially influenced by the guiding principles of European environmental law, namely, the precautionary principle as well as the principles that preventive action should be taken, that environmental damage should as a priority be rectified at the source and that the polluter should pay (Article 191(2) Treaty of the Functioning of the European Union). The protection of all waters in one single piece of framework legislation, the need for achievement of a “good status” for all waters as a legally binding rule, and water management based on a river basin approach have a strong impact on the management of European waters and thereby paved the way for modern water legislation. The following paragraphs outline the main legislative provisions of the WFD by describing the scope of the Directive, the river basin management approach, environmental objectives for all waters and protected areas by a set deadline, the use of economic instruments, the need to establish a Program of Measures and a River Basin Management Plan coordinated with the Flood Risk Management Plan, the implementation cycle and regular reporting, as well as public information and consultation measures. Article 1 defines the purpose of the Directive by expanding the scope to inland surface waters, transitional waters, coastal waters, and groundwater. Coordination of administrative arrangements shall be made within districts whose outer boundaries are defined by the perimeters of catchments within the river basin in question, i.e., river basin districts. These are natural geographical and hydrological units as opposed to previous definitions based on political boundaries. Article 3 includes detailed provisions as to how EU Member States need to ensure coordination and cooperation in shared river basins across administrative and political borders. The environmental objectives for surface waters include the prevention of deterioration of status, the need to achieve “good status” by a set deadline and to progressively reduce pollution from priority substances, and the need to cease or phase out emissions, discharges, and losses of priority hazardous substances. As for groundwater, the environmental objectives comprise the prevention or limitation of pollutants leaching into groundwater, the prevention of deterioration of the status, the need to achieve “good status” by a set deadline, as well as measures to reverse any significant and sustained upward trend in the concentration of any pollutant. The need to achieve “good status” for all surface waters and groundwaters by set deadlines is one of the most essential rules enshrined in Article 4 of the Directive. The class “good status” is defined in terms of ecology (biology and morphology) and chemistry for surface waters as well as chemistry and quantity for groundwater. By using an intercalibration method to classify results for biological quality elements (five classes), type-specific reference conditions for the boundary between the classes of “high” and “good” status and for the boundary between “good” and “moderate” status, which are consistent with the normative definitions of those class boundaries given in Annex V of the Directive, were established (European Commission 2011a). This process aimed to ensure consistency and comparability in the assessment of good ecological status, representing the same level of ecological quality for aquatic ecosystems everywhere in Europe. The “one out, all out” approach defines the final status of water bodies, i.e. if an individual quality element is not achieving good status for a particular watercourse, then the entire water body is classified as failing. In other words, the worst status of the decisive elements (ecology and chemistry for surface waters, chemistry and quantity for groundwater) used in the assessment of a water body determines its final status. According to Article 4 and Annex IV of the Directive, EU Member States shall achieve compliance with any standard and objectives in protected areas by the year 2015, unless otherwise specified in Community legislation. This provision refers to areas designated for the abstraction of drinking water and for the protection of economically significant aquatic species, bathing waters, nutrient-sensitive areas [vulnerable zones under the Nitrates Directive (European Council 1991a) and sensitive areas under the Urban Waste Water Treatment Directive (European Council 1991b)], as well as areas designated for the protection of habitats or species under the Birds and Habitats Directives (European Council 1992; European Parliament and Council 2009). Article 9 integrates economic instruments and the promotion for a prudent use of water resources into European water management. The introduction of water pricing is certainly one of the Directives’ most important and controversial innovations. Adequate water pricing acts as an incentive for the sustainable use of water resources and thus helps to achieve the environmental objectives under the Directive. EU Member States are required to ensure that the price charged to water consumers for water services—such as for the abstraction and distribution of freshwater and the collection and treatment of urban wastewater—reflects the true costs by including environmental and resource costs, taking the “polluter pays” principle into account. According to the interpretation of the European Commission, the concept of water services does not only refer to drinking water and wastewater treatment but also to water abstraction for the cooling of industrial installations and for irrigation in agriculture, the use of surface waters for navigation purposes, flood protection or hydropower production, and wells drilled for agricultural, industrial, or private consumption. However, a recent decision of the Court of Justice of the European Union (judgment of 11 September 2014, case C-525/12, Commission v Germany) decided that EU Member States may, subject to certain conditions, opt not to proceed with the recovery of costs for a given water-use activity, where this does not compromise the purposes and the achievement of the objectives of Article 9 of the Directive (Court of Justice of the European Union 2014). In order to achieve the environmental objectives of Article 4, EU Member States shall ensure the establishment of a Program of Measures according to Article 11. Each Program of Measures shall include basic measures (Annex VI Part A) and, where necessary, supplementary measures (Annex VI Part B) going beyond legally required basic measures. Basic measures refer to European water legislation as a whole and relate to drinking and bathing water, urban wastewater treatment, groundwater protection, floods, and protection of waters against agricultural pressures or industrial emissions. Measures follow the combined approach (Article 10) for point and diffuse sources by including emission limit values and quality standard measures to achieve the quality objectives. Supplementary measures may, inter alia, include national legislative, administrative, or economic instruments, codes of good practice, and educational or research projects going beyond the legal requirements of basic measures. Due to its strong interlinkages, Article 9 of the Floods Directive (European Parliament and Council 2007) explicitly states that EU Member States shall take appropriate steps to coordinate the implementation of the Floods Directive and WFD focusing on opportunities for improving efficiency and information exchange and for achieving common synergies and benefits with respect to the environmental objectives of the WFD (European Commission 2014). Consequently, according to the WFD, River Basin Management Plans need to be closely coordinated with Flood Risk Management Plans required by the Floods Directive. Flood Risk Management Plans highlight the hazards and risks of flooding from rivers, the sea, surface water, groundwater, and reservoirs and address all aspects of flood risk management. They focus on prevention, protection, and preparedness, including flood forecasts and early warning systems and taking into account the characteristics of the particular river basin. Information about how Flood Risk Management Plans will take into account environmental objectives according to the WFD and how measures under the River Basin Management Plan and the Flood Risk Management Plan will be coordinated shall be provided in the plans. According to the European Strategic Environmental Assessment Directive (European Parliament and Council 2001), plans and programs for water management according to the WFD and the Floods Directive setting the framework for future development consent of projects listed in the European Environmental Impact Assessment Directive (European Parliament and Council 2011) are subject to a mandatory environmental assessment. This includes an environmental report in which the likely significant effects on the environment and the reasonable alternatives of the proposed plan or program are identified. The public and the environmental authorities need to be informed and consulted; in case of plans and programs which are likely to have significant effects on the environment in another EU Member State, the plan or program must be implemented in consultation with the other EU Member State(s). The WFD requires a clearly set 6-year implementation cycle, starting with a report about the analysis of the characteristics of the river basin district(s), including a pressure and impact analysis (Article 5), defining a Program of Measures to achieve the environmental objectives (Article 11), and a reported summary of all elements in the River Basin Management Plan (Article 13). The latter sets the scene for river basin management planning in the 6-year implementation period. The milestones in the implementation of the WFD since the year 2000 included a first analysis of the river basin district(s) by 2004, the establishment of monitoring programs by 2006, a Program of Measures based on the analysis and the findings of the monitoring measures, and a first River Basin Management Plan by 2009. A review and update was made in the River Basin Management Plan 2015 and will be made every 6 years thereafter. Plans and programs need to be reported to the European Commission, which has the objective of regularly publishing a report on the implementation of this Directive in EU-28 Member States (Article 18). The first and second implementation report published by the European Commission included information about the first stage of implementation in the year 2007 and the monitoring networks in 2009. The third implementation report providing results of the first River Basin Management Plans was issued by the European Commission in 2012 (European Commission 2012a) and will be published every 6 years thereafter. Additionally, within 3 years of the publication of the implementation report, the European Commission regularly publishes an interim report describing progress in implementation of the Directive; the fourth implementation report includes a review of progress in the implementation of the Programs of Measures planned by EU Member States in their second River Basin Management Plans (European Commission 2015a). In order to better involve citizens in water management issues in Europe, Article 14 stipulates an active involvement of all interested parties in the implementation of this Directive. In particular, the production, review, and updating of the River Basin Management Plans have to be subject to public participation; a timetable and work program for the production of the plan need to be made available for comments 3 years, an overview of the significant water management issues 2 years, and a draft of the River Basin Management Plan 1 year before the final publication of the plan; interested parties have 6 months to comment on these documents (Article 14). This process aims at ensuring that the balancing of diverging interests in the different stages of implementing the Directive is fully taken into consideration and, furthermore, to ensure that the different plans, programs, and measures are subsequently effectively put into operation. The Birds Directive (European Parliament and Council 2009), adopted in 1979 and amended in 2009, relates to the conservation of all species of naturally occurring birds in the wild state and covers the protection, management, and control of these species. The Habitats Directive (European Council 1992), adopted in 1992, contributes toward ensuring biodiversity through the conservation of natural habitats and of wild fauna and flora in the European territory, taking account of economic, social, cultural, and regional requirements. Both Directives form the cornerstone of Europe’s nature conservation policy and establishes the EU-wide Natura 2000 ecological network of protected areas, safeguarded against potentially damaging developments (European Commission 2016d). The Birds and Habitats Directives and the WFD aim to protect healthy aquatic ecosystems while at the same time ensuring a balance between water/nature protection and the sustainable use of nature’s natural resources. Many synergies are possible, since the implementation of measures under the WFD will generally benefit the objectives of the Birds and Habitats Directives (European Commission 2011b). A strong coordination between water and nature conservation authorities is necessary in order to coordinate and streamline implementing measures (Janauer et al. 2015). A direct linkage between the WFD and the Birds and Habitats Directive is established in Articles 1, 4, and 11 (accompanied by Annex IV and Annex VI) of the WFD. The purpose of the Directive is, inter alia, to prevent further deterioration and protect and enhance the status of aquatic ecosystems and, with regard to their water needs, terrestrial ecosystems and wetlands directly depending on the aquatic ecosystems. The environmental objectives enshrined in Article 4 and Annex IV require the protection of habitats or species where the maintenance or improvement of the status of water is an important factor in their protection, including relevant Natura 2000 sites, the network of areas designated according to Birds and Habitats Directives. In order to achieve the environmental objectives, the Program of Measures according to Article 11 and Annex VI Part A stipulates the need to apply measures required under the Birds and Habitats Directive. 17.4 Challenges for the Future: How Can Modern Water Legislation Address and Adapt to It? The multidimensional regime of modern water legislation is composed of international water law, water law of the European Union, and national water legislation guided by the concept of integrated water resources management (Reichert 2016). Awareness is increasing at the international and European levels that freshwater resources are limited and need to be legally protected both in terms of quantity and quality. European water law has introduced clear and legally binding objectives, a common terminology, and managerial framework as well as provides for robust enforcement and compliance mechanisms under judicial review, including financial sanctions for non-compliance. This is the reason why European water law has, to a growing extent, substantial influence on transboundary water cooperation that extends beyond the European territory (Reichert 2016). The adoption of the WFD was considered as a major development affecting the implementation of the UNECE Water Convention (Wouters and Vinogradov 2003). However, aquatic environments continue to face pressure, often suffering from pollution, over-abstraction, morphological alterations, loss of biodiversity, floods, and droughts. The main challenges on European level, analyzed on the basis of the results of the first WFD cycle covering the implementation period from 2009 to 2015, showed deficits in the identified measures to achieve the environmental objectives, in water pricing and cost recovery of water uses, over-abstraction of water, the change in flow and physical shape of water bodies, and ongoing pollution caused by agriculture, industry, and households (European Commission 2015a). The good ecological status of water bodies improved from 43% in the year 2009 to 53% in the year 2015 (European Commission 2015b). Further progress is needed to implement and achieve the objectives of the WFD and related water-specific legislation. 17.4.1 Is European Water Law Fit for Future Challenges? In recent years, European freshwater policy and legislation has undergone comprehensive evaluations designed to ascertain whether the regulatory framework is fit for purpose. The so-called Fitness Check looked at relevance, effectiveness, efficiency, and coherence of water policy and legislation, in order to identify any excessive regulatory burden, overlaps, inconsistencies, and/or obsolete measures in place or gaps in the legislative framework (European Commission 2012b, c, 2016e). The results of the assessment formed a substantial basis and present a building block of the Blueprint to Safeguard Europe’s Water Resources, thereby defining a new EU strategy on the use of water resources by outlining clear actions for the upcoming years (European Commission 2012b). The WFD (European Parliament and Council 2000), the Groundwater Directive (European Parliament and Council 2006), the Directive on environmental quality standards in the field of water policy (European Parliament and Council 2008), the Nitrates Directive (European Council 1991a), the Urban Waste Water Treatment Directive (European Council 1991b), and the Floods Directive (European Parliament and Council 2007) were examined in the frame of the Fitness Check. Additionally, quantitative and adaptive water management issues—water scarcity and drought as well as climate change adaption—for which there is currently no legislation at European Union level were included in the evaluation. In the same vein, the Birds and Habitats Directives are currently being evaluated to ensure that they are “fit for purpose” (European Commission 2016f). The Fitness Check of European freshwater policy and legislation has confirmed the relevance of the current water policy framework to address the key challenges faced by European freshwaters, namely, water quality, water scarcity, droughts, and floods as well as significant pressures from the discharge of pollutants, hydro-morphological alterations, and water abstraction. A need has been identified to focus more on water efficiency (water demand management and water availability) and on integrating quantity and quality aspects of water management (European Commission 2012c). The effectiveness of most of the legislation is slowed down by the fact that there have been considerable delays in implementation at the national level. However, strong enforcement and compliance mechanisms, including infringement procedures, have prompted action and sped up implementation. An efficient use of EU funding could substantially support implementation, in particular, as regards implementation measures in the field of urban wastewater and by preventing nitrates from agricultural sources polluting groundwater and surface waters. A significant number of EU Member States have relied on exemptions from the environmental objective to reach “good status” by a certain deadline. A thorough check must be made, to ensure that the conditions under which the exemptions were granted are being fulfilled (European Commission 2012c). The WFD has brought effective improvements in coordination between administrations within and between EU Member States and also with third countries. Due to the current economic situation in most of EU Member States, there is uncertainty about possible gaps in financing water policy. The efficient implementation of EU water policy requires both financial and administrative resources. Assessments showed that many EU Member States lack a consistent methodology for assessing and monetizing the costs and associated benefits of implementation measures that support cost-effectiveness (European Commission 2012c). Thus, it is important to measure and monitor the balance between the costs and benefits of such policies, and more effort needs to be made to develop and apply methodologies that produce reliable and comparable data to underpin the cost-effectiveness of measures. By streamlining and simplifying EU water legislation, the WFD has eliminated potential double requirements in the field of water legislation and considerably reduced the risk of contradiction between different legal instruments. The Fitness Check has identified areas where synergies between water and other environment (related) policies water should be better aligned (European Commission 2012c). It has also underlined the need for improvements in relation to integration of water policy objectives and other policy areas (agriculture, energy, hydropower, navigation, nature protection). In this respect the potential of the River Basin Management Plans as an integration tool needs to be further strengthened. Conflicting interests, such as between water protection and hydropower development, might be addressed in the plans by setting the scene for a cycle of 6 years and defining guiding principles and a framework of how to weigh environmental improvements up against the social benefit of hydropower production. The WFD will be reviewed by the year 2019 to see whether proposals for amendments are necessary to facilitate the achievement of its legally binding objectives; the legislative basis for review is set in Article 19.2 of the WFD. Additionally, legislation regarding urban wastewater treatment and drinking water is currently being looked at. Based on the findings and conclusions as well as defined actions included in the Blueprint to Safeguard Europe’s Water Resources (European Commission 2012b) and the Fitness Check of European freshwater policy and legislation (European Commission 2012c), evaluations in the frame of the required review will further assess the adequacy of current legislation and its implementation. The issues of the different level and quality of implementation, the significant use of exemptions, as well as economic and social impacts of the implementation are topics to be discussed in the reviewing process and are described in the following paragraphs. Due to the flexibility in how to achieve the obligations and objectives set in the Directive, the level and quality of national implementation of the legal framework is often different in EU Member States. Although the need for flexibility due to the regional variations and environmental differences in circumstances is recognized, the risk that unambitious national practices will lead to a lack of practical effectiveness needs to be avoided (Keessen et al. 2010). This is particularly relevant as such divergences in implementation between EU Member States can hamper cooperation in transboundary river basins (European Commission 2012c). Considerable differences were found in the implementation of water-related legislation (nitrates, urban wastewater), in governance structures, in quantitative aspects of water management, and in putting in place measures that target abstractions and flow regulations as well as water pricing (European Commission 2012c; European Commission 2015a). Based on the findings of the first River Basin Management cycle, it becomes clear that the water environment is still under great pressure from economic activities, urban and demographic developments, as well as climate change (European Commission 2015a). The significant number of exemptions indicates that the good status may not be completed for many years. None of the legislation under consideration has achieved all the objectives it was expected to have achieved at this stage (European Commission 2012c, 2015a). A range of exemptions without appropriate justification occurred because many EU Member States have often only estimated how far existing measures will contribute to the achievement of environmental objectives (European Commission 2015a). More efforts and actions are certainly needed in the implementation process. On the other side, it is also necessary to look at issues that might hamper better implementation results due to policy reasons. The “one out, all out” approach in defining the status of water bodies is criticized by several EU Member States (European Commission 2015b). Although being consistent with the precautionary principle, it led to the fact that improvements in the status (of one quality element) are somehow hidden in a negative picture that is insensitive in showing progress in achieving the objectives of the Directive. Therefore, additional indicators (or a separate presentation of results to achieve the environmental objectives) are needed to support the communication with stakeholders in order to better acknowledge the measures that have already been implemented and to promote the best and most efficient use of investment for environmental outcomes (European Commission 2015b). Economic circumstances and limited available budget often impact implementation, especially where costs might be unfeasible for several European States. In this regard, discussion continues as to how to modify the process beyond the year 2027 (end of third implementation cycle) to better account for different economic circumstances and technological developments in the future. There is certainly a need for innovative and fortified solutions in terms of technologies, management approaches, governance, and funding to better support successful implementation of the legislative framework. The legislative framework for river ecosystem management on international and European level is guided by an integrated water resources management approach that substantially influences national water legislation. The main principles enshrined in the international water conventions and relevant legally binding provisions of the European WFD have triggered new thinking in water management that crosses administrative boundaries, establishes a cyclical planning process, and paves the way for modern water legislation. Evaluations in the past years concluded that the current water policy and legislative framework addresses the key challenges faced by European freshwaters. However, there might be a need for review and adaption in order to better address water management issues in the twenty-first century. And finally it is a matter of political will and stakeholder motivation and commitment to further foster successful implementation of the legislative framework for river ecosystem management in the years to come. Open Access This chapter is licensed under the terms of the Creative Commons Attribution 4.0 International License (http://creativecommons.org/licenses/by/4.0/), which permits use, sharing, adaptation, distribution and reproduction in any medium or format, as long as you give appropriate credit to the original author(s) and the source, provide a link to the Creative Commons license and indicate if changes were made. The images or other third party material in this book are included in the book's Creative Commons license, unless indicated otherwise in a credit line to the material. If material is not included in the book's Creative Commons license and your intended use is not permitted by statutory regulation or exceeds the permitted use, you will need to obtain permission directly from the copyright holder.